Water is vital for health, so why is it so hard to drink enough of every day? We need to stay hydrated to function well. Our body organs depend on it and without it, we’d die. Considering that, you’d think water would taste like marshmallows or wine. Unfortunately it doesn’t, so we have to think up strange and creative ways of forcing ourselves to drink enough to get us by. 1.) Make sure it’s clean. Town water can taste a little like chlorine or metal, so try filtering it first. You may find that improves the taste. 2.) Carry it with you. It’s easy to forget to drink but if you always have a water bottle with you and keep it full, there’s more chance you’ll sip through the day. 3.) Tea it up. Swap out coffee and black tea for naturally caffeine free variations like hibiscus or jasmine. They taste great hot or cold. 4.) Add fresh herbs or fruit. A slice of orange, a handful of berries, mint or cucumber at the bottom of your drink bottle will give a little flavour without adding sugar or additives. 5.) Add it to food. It’s harder to drink water when it’s cold, so incorporate water based soups into your day instead. Chicken broth and vegetable soup are great options. 6.) Eat it. 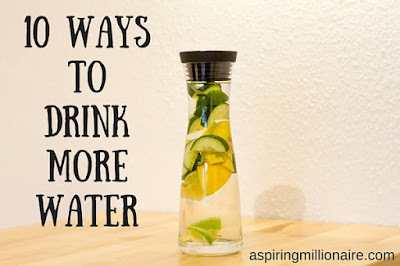 Foods with a high water content like celery and fruit will increase your hydration levels. 7.) Force yourself to drink it. By making yourself drink a small glass of water a few times per day, you’ll adjust quickly and start craving it when you don’t. 8.) Add ice. Some people find this make water more enticing. 9.) Have it hot. A hot cup of water with a slice of lemon will warm you up on a cold morning and set your digestive function up for a great day. 10.) Try an app like waterlogged. They remind you to keep drinking water through the day. Make sure you stick it out. Your bladder will adjust after a couple of weeks and so will your body. After a while it will get easier and you’ll find yourself reaching for the water without even thinking of it!